I received some wonderful news last week - I have been selected to represent Fit Fluential in the St. Pete Women's Running Series (WRS) Half Marathon! I remember hearing about this series for the first time in 2011. I was not a runner at the time but my Best Friend was a few months away from running her first half. This series gave me encouragement to become a runner. They celebrate women runners of all shapes, speed and size and I knew one day, I would be run it. Are you an aspiring runner or one who wants to push your distance further? Now is the perfect time to make a goal that you can commit to. I hear way too often "I can't run" - trust me, if I can do it, you can do it. 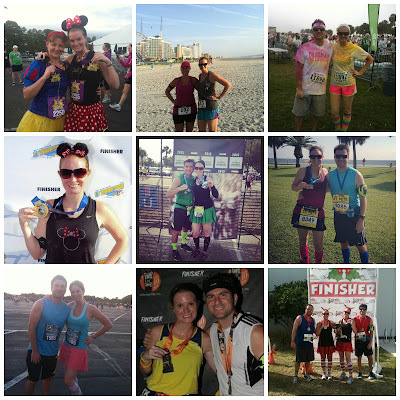 I recently completed what would have been my 5th Half Marathon in 3 months. I say would've because I had to switch into a relay due to an injury caused from a pedicure. When I first started running in January of 2012, I trained with the C25K app on my phone and I could barely run two minutes straight. I remember looking at my phone like it was an alien when I got to week 5 (running 20 minutes straight). While their program absolutely got me off the couch, I didn't follow it precisely. I like to say I used a mix of C25K, the Galloway method and the Megan method (what felt right to me). It's hard to believe that was a little over a year ago, what a ride it has been. The Women's Running Half Marathon series kicks off in Bloomington, MN on June 16th (the day before my Birthday!). Fellow Fit Fluential Ambassador Lee from Fit Foodie Finds has been selected to participate in this campaign and has a discount code for this race. Make sure you check out her awesome blog for more information. Lee is also starting a running meetup if you are in the Bloomington area! The Women's Running St. Pete Half Marathon and 5K is on November 24th. I have told many of my friends who are not runners that they have plenty of time to train and run this with me. There are so many half marathon training guides out there and the best advice I give is find one you are comfortable with and do not stress yourself out. Running should be about achieving YOUR goals, not about who is fastest or who runs the most miles in a week. Check out this article from Women's Running Magazine which has training guides for all levels of runners. I have a discount code for the Women's Running St. Pete Half Marathon and 5K! Save $10 off your registration with the code FITFLMEG. This discount is valid through 11/23/2013, click here to register. If you are located in the Tampa area and are interested in joining a WRS meetup, send me an email. We can meet monthly through November. Women's Running Series was formerly called the Women’s Half Marathon. It is the nation’s largest women’s half marathon series in the country. The series is produced by Competitor Group, owners of the Rock-n-Roll Marathon Series. The 2013 races will be held in Bloomington, MN (June 16); Nashville, TN (September 28); Scottsdale-Tempe, AZ (November 3); and St. Petersburg, FL (November 24). Finishers receive a two-in-one finisher’s medal with removable charm, goodie bag, race tech tee, personalized bib and more! Make sure you follow Women's Runninng Series on Facebook and Twitter (hashtag #beamazing) to follow along with multiple runners achieving their goals over the next 8 months. I am do proud of you!!! This list gave be goosebumps when you talked about both your dad and your stepdad. You are such an inspiration!! So proud*. This post*. Lol... Silly autocorrect!